#5226 found @ 16:42:00, cache 11 of 11 today, geostreak Day #313. 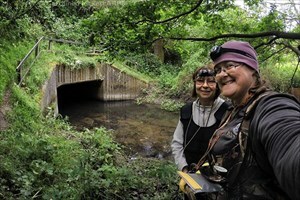 Out with Kitty today for a girls' day out, mopping up a few previous DNFs on the Takeley Trail and tackling a couple of higher DT caches near Braintree. All good fun with only two frustrating DNFs. As well as polishing off some of the DNF's we had along the Takeley Trail a while back, today was all about tackling this one. We had both come prepared with our waders, head torches and dry bags for the tech. The only thing missing was a couple of big sticks to act as depth gagues and supports as we picked our way along the tunnel. Having done a quick scout out around the entrance, we found a nearby tree which had recently seen some storm damage and managed to break off a couple of likely candidates. Then we proceeded to don our waders. Kitted out, we posed for a quick selfie on the bank before sliding gently into the mire and along to the tunnel mouth. Initially hugging one wall, we got so far and found the going was getting very soft underfoot. I wasn't happy to continue along that route, so we made our way past the submerged bike and along to the other wall. It seemed much better that side, and we inched along being careful to mind where our feet were stepping. I'm not keen on spiders, and there were a few hanging around the roof but I held my nerve and Kitty held hers (she told me afterwards she was rather freaked out by imagining what she might be stepping on). We inched along slowly, turning the torches this way and that, looking for something out of place. We weren't sure how far we needed to go, but we hadn't reached the other end yet. All of a sudden, a glint showed the way and we both homed in on the object in question. There was plenty of teamwork for holding lids, pens, logs, sticks, tweezers and other bits and pieces to ensure we didn't drop the lid or the log in the drink, and we were done! What relief!! Another selfie taken (of course) and back along the way we glooped. Eventually we arrived back at the bank. Kitty managed to get out quite quickly, but every place I tried to step out, my wellies were slipping me back into the water. Eventually I gave up and wallowed out, somehow. Kitty has some choice photos of the process, which I guess she will post with her log! Thanks for a great adventure. A fave, of course.